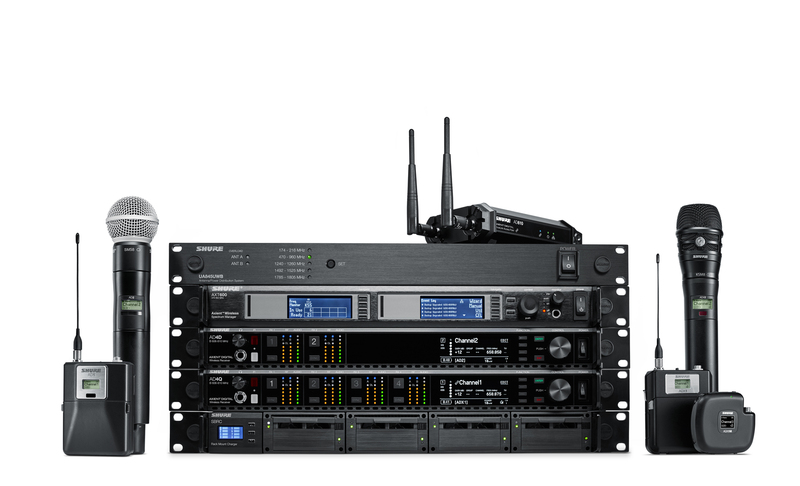 RSG Stays Ahead of the Spectrum Curve | Riverview Systems Group, Inc.
At the end of last year, we announced an expansion of our professional audio technology inventory with the addition of more than 100 Shure Axient® Digital and ULX-D Wireless microphone systems. This move not only demonstrates our continued commitment to deliver state-of-the-art audiovisual technology to clients across all areas of the company’s business, but it brought us into compliance with new FCC spectrum regulations, well ahead of the published deadline of April 1, 2018. If our professional experience servicing live events over the past 30 years has taught us anything, it’s that taking a decidedly proactive approach to crucial business decisions is always good business practice. We view our responsibility as live event technical producers and systems integrators to educate the general public about the spectrum auction and the resulting need to change. Most churches and public venues that have an installed base of equipment have not typically registered with the FCC as users, even though that is a requirement under the law. Further, many end users are likely not aware that they have to change their systems and work within tighter and tighter frequency ranges. In addition to updating all of our wireless microphone and intercommunications equipment inventory for production rental, we have been working diligently with our integration customers to get them all up to speed on the new rules and the many options available to upgrade their legacy systems. Staying a step ahead of the technology curve to avoid any signal failure issues with our wireless devices during our live event productions is critical to our success. We rely on the informed expertise of our talented team of A/V professionals, including our very own spectrum compliance expert, Mark Riggs, who continues to oversee and advise on these important issues. This allows us to deliver the “Right the First Time” service that our customers have come to expect.